Spiked with the same high-caffeine Guarana that fuels the amazing BAWLS soft drink, these fizzy sweet mints help you stay up all night. 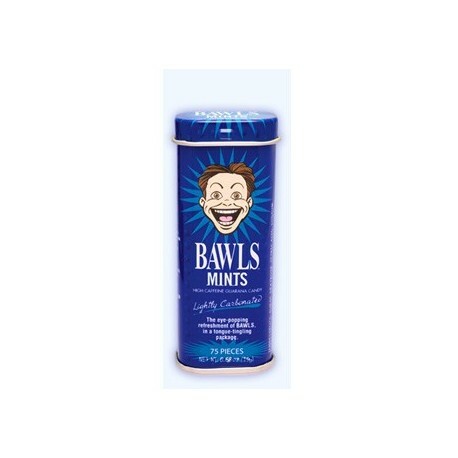 They\'re even slightly carbonated to mimic that authentic BAWLS experience. Twelve of these little yummy blue morsels has the same punch as a bottle of BAWLS. About 1mg of caffeine per mint and about 75 mints per tin. Just f.y.i., they don\'t taste like mints at all. Why they called them mints is beyond us. They taste like a cross between something fruity and vanilla. Don\'t forget the carbonation. Carbonated fruity vanilla. Or something like that....But they still taste great, and they're extremely addictive! Wow these candies are amazing! The flavor is very distinct and delicious! I've had it for one day and almost eaten the whole tin!